I'm guessing you could use a free season pass for next year? 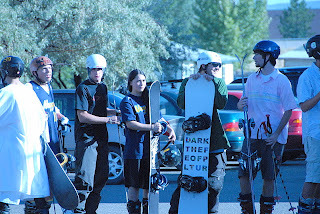 Or maybe some free lift tickets for this season? I bet you would take almost anything that's free right? Snap some pictures of you, your friends, and/or your family out having fun at Powderhorn. Email them to shoot@powderhorn.com. Best pics (video is welcome too) will win tickets and other prizes. THE best picture of the whole season will win a season pass for next year. Tell your friends and have everyone vote for your pics.....may the best photo win! Want the details sent straight to your cell phone? Just text 'SHOOT' to 95495. Reservations are still open for the best Learn To program of the year! This series is for first timers, new to the sports of skiing or snowboarding. Attend all 3 sessions and get a season pass FREE for the rest of the season! Participants must be first timers and must attend all 3 sessions to qualify for their season pass. Sorry for the dry attempt at some humor but the snow is as dry as the joke and it's still coming down hard. With more snow expected tonight and tomorrow, it looks like we have a very white Christmas in store for you! Up to 6 more inches possible! What a great present. On behalf of all the staff at Powderhorn, we'd like to say Merry Christmas and thank you for being our guests. We hope you have a great time with family and friends! This holiday season we are partnering with St. Jude Children's Research Hospital for the Thanks and Giving Campaign. Now through the New Year, you'll have an opportunity to donate $1 to this campaign at any of our checkout locations in the lodge. We are proud to support St. Jude's because they are the only pediatric cancer research center that pays for all treatment not covered by insurance, regardless of a family's ability to pay. Eighty-five cents of every dollar donated goes directly to patient care and research. We encourage you to Give thanks for the healthy kids in your life, and give to those who are not. If you like to stay a little closer to the ground then you'll want to check out the Tyro Park on EZ. 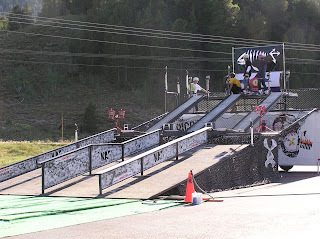 It will have smaller rails and jumps for those wanting to learn to jib and jump. Keep in mind, the first park event will be here before you know it! 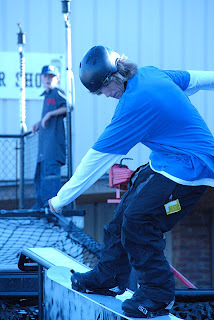 New Year's Eve Rail Jam...only $5 to enter! 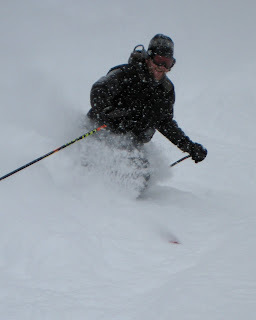 The snow just keeps falling! Hey we're not complaining. It's snowing pretty heavily right now and there's no wind so it could pile up pretty quickly. 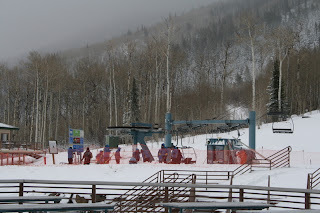 Almost all of the mountain is open which is almost unheard of this time of year. 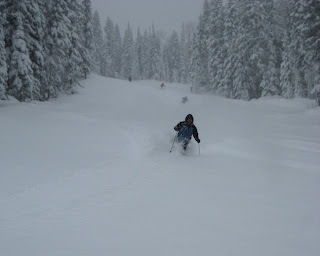 The glades are skiing especially nice. Here is a little video of the festivities yesterday. It's not Academy Award quality or anything but we'll get better at this as the season goes on. Welcome back for the 07-08 season! HAVE FUN! The forecast has some good news for us. We could get a foot of snow between now and Saturday. That would make for an extra fun opening day! If you'd like powder alerts and special deals sent straight to your cell phone, just text 'DEALS' to 95495. When it snows like crazy you'll be alerted right away and every so often we send out great deals just for those that are signed up. It's a free service from Powderhorn and we promise you won't be flooded with useless stuff. 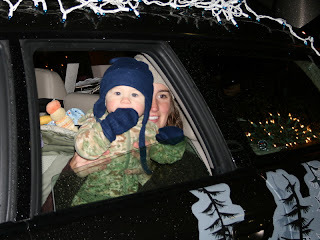 I want to commend all of you that came out to the Parade of Lights this weekend! 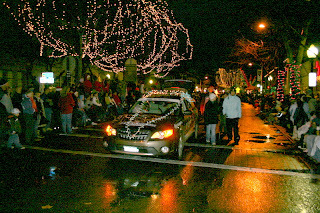 You weathered a little hurricane that threatened the whole parade. Thankfully it only lasted a few minutes. We were all wearing water-proof ski gear so nothing was stopping us! It was a really fun time. We're already cooking up plans for a bigger and better float next year. I see a large flat-bed trailer with a lift chair on it and some trees. We'll have people completely decked out, skis and all, sitting on the chair. 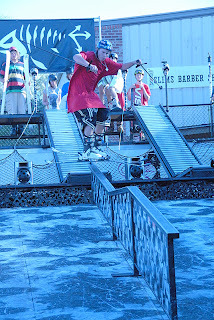 Then we need some sort of launcher to shoot t-shirts, coupons, and a few free lift tickets into the crowd. We also learned that we need to buy even more candy. 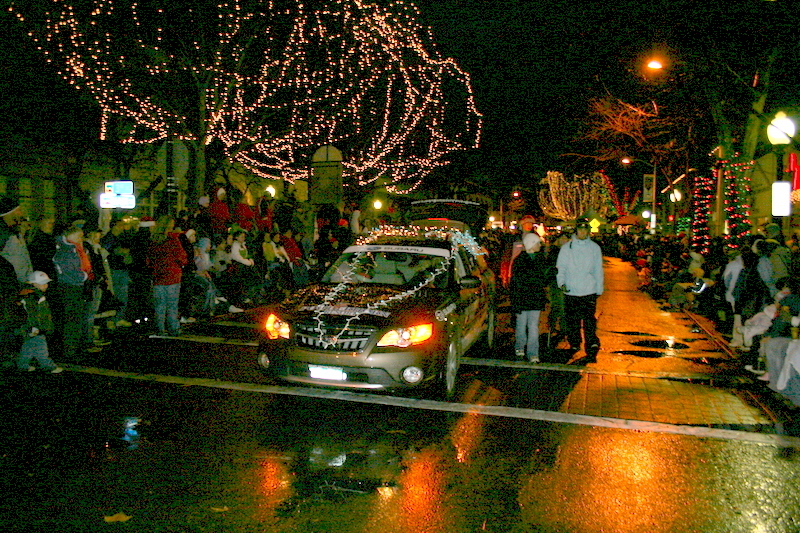 The Parade of Lights is this Saturday on Main Street in GJ starting at 5pm. We'll be there! Hope you will too. Powderhorn is the 10th entry so look for us as the parade gets started. We'll be passing out coupons for free hot chocolate and coffee from the Sunset Grille as well as $5 off ski/snowboard tunes from the Rental Shop. There will be a healthy dose of candy going around too. All week we've been trying to come up with a way to pull skiers behind our Subaru....so far we haven't come up with anything that is reasonably safe or practical. If you have an idea, let us know! 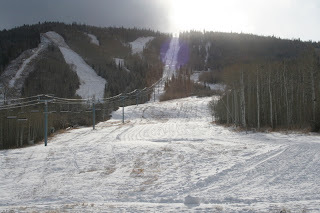 A blog reader asked if snowmaking operations are underway yet. It's really hard to see on our webcam...mainly because it's a piece of junk. We're buying a new fancy webcam that will give higher resolution shots and be much more reliable. 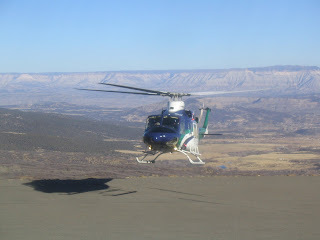 All 3 news stations will be at Powderhorn this week with different stories. So look for those as there will be snowmaking updates. We finally received a little love from Mother Nature. 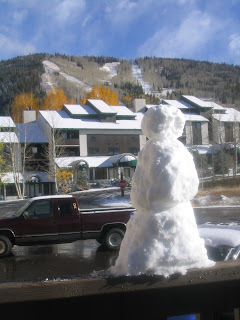 Now I haven't seen it myself as I'm not even in Colorado, but I hear we got about 2-3 inches at the base and much more on top. Cold temperatures have helped snowmaking get under way as well. Keep snow dancing...it could really pay off. And a big Happy Thanksgiving tomorrow from all the folks at Powderhorn! Hallelujah! Bus service from Grand Junction to Powderhorn is back for another season. You might be wondering what the 'hallelujah' was all about. We weren't certain until recently that bus service would be offered again this year. Laidlaw was bought out this fall by Students First. With all the changes, they were unsure that they would be able to provide the service this season. But they're making it happen for which we are very grateful. Click here for the schedule and prices. Now...envision the voice of your stern grandmother for this....Please keep in mind that any shenanagins on the bus will make you unwelcome on the bus and at Powderhorn. We want to keep this service available to everyone so please don't abuse it! If you've been trying to get on our website this morning and have had no luck....it's not your computer, it's our server. We apologize, the site is down for 3 hours while we move it to another server. From what I hear, the server it was living on "freaked out." It should be back up and running by noon today. I realize some of you might be trying to order Plus Cards since today is typically the last day BUT we've pushed back the deadline to December 1st. If you'd like to order one today you can call us at 970-268-5700. Otherwise you can order it online as soon as the site is on the new server. Now that we've all gotten settled in our new offices, we can refocus on the push to opening day. We open in exactly 1 month! While it's been a little warmer than normal for this time of year, it looks like a cold front will slide in on Sunday. The low forecast for the mesa Sunday night is only 12 degrees so we should be on schedule to start snowmaking the week of the 12th. The pace has definitely picked up. The amount of Starbucks cups I see in the trash rises as the number of days to Opening Day decreases. As I've said before, people always ask me what it takes to open for ski season. It's a little more than turning on the lifts. 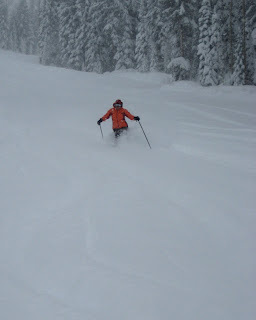 Last week we completed our last round of lift inspections to get the final 'go' to host public for ski season. The rental shop managers have arrived to start sorting out their inventory. They had a little hickup though as they found their computer had gotten fried over the summer do to a lightning strike. Our IT manager is burning roughly 10,000 calories per day right now running around the mountain checking ticketing systems, replacing computers, and (as always) answering our wonderful questions. Did you know a computer technically has to be plugged into an outlet in order to work? In marketing we are wrapping up our travels to various ski shows, setting up sponsor and advertising contracts, planning events, and watching the occasional ski video....for inspiration of course. The ladies of the Alpine Trader are once again buried in merchandise. And the ticket office is consuming large amounts of chocolate to keep them sane as they print pass after pass. If you have a request for our ticket manager right now you have to knock on the door, hand her chocolate, make your request, smile, and bow before you leave. As the alarm went off at 5:30am on Saturday I laid there wondering why I had to get up at such a rediculous hour on a Saturday. Ah, the ski swap! It's much easier to get out of bed that early when it's skiing related. Many of you showed up bright...or dark...and early this year to snag all the great deals. 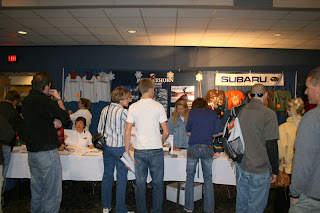 It's always exciting for us to see familiar faces again and to talk about our hopes of powder for the upcoming season. Thanks to everyone who stopped by the booth to pickup a Plus Card or have their pass photo taken. I saw many of you snag amazing deals as well. By the end of the show, merchandise was marked down to 75% off! The family on the left has the right idea- get the kids up high to scout for the best deals. 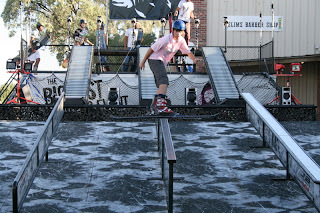 Eightch Snowboards- locally owned quality snowboards. 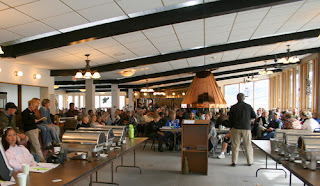 Look for their tent at Powderhorn this season! 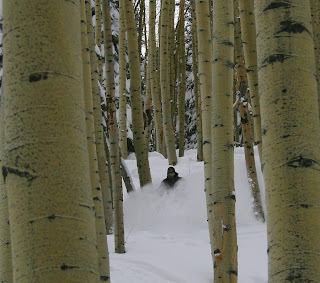 As we gear up for the ski season, which can't get here soon enough, we're putting together a lot of interactive ideas. For example, starting this season we will be uploading video as well as picture on the site. We have a Shoot Out contest coming up where you have a chance to win tons of prizes by uploading pictures of you and your friends at PH. Details coming soon. - Coverage of all Powderhorn events. We like to showcase our guests having a good time and contest winners. 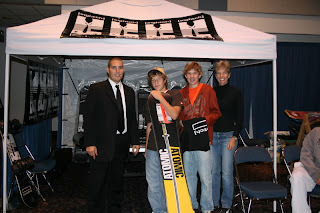 - 2008 SIA Tradeshow (Las Vegas)- We're supporting 2 of our locals who are national finalists for the DNA rail jam tour. 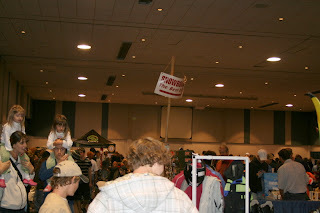 You'll also get to be the first to see all the 2009 ski/snowboard gear. Everyone likes a good deal right? Well we have plenty of deal opportunities headed your way in the next two weeks. Deals: ski & snowboard gear, get a Powderhorn Plus Card, season passes are still 10% off, Warren Miller's Playground @ 8:00- FREE lift ticket on every movie ticket stub! Don't forget, the ski swap is also the last place in Junction to get your season pass photo taken. 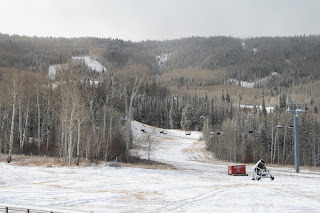 Deals: Powderhorn will have a great BOGO deal! Get 2 lift tickets for only $49. NO BLACKOUTS, TOTALLY TRANSFERABLE! Check out all the great deals from all the Gems resorts that weekend. There will also be loads of free stickers at our booth and giveaways on the main stage all weekend. 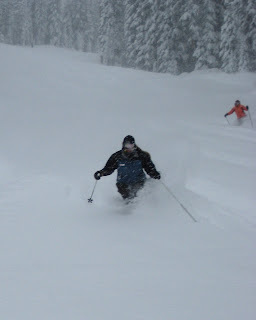 Also, anyone can sign up for our text deals and powder alerts! 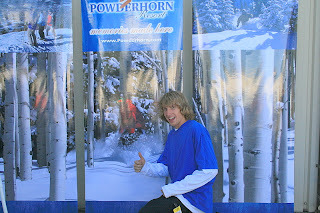 Sign up at www.powderhorn.com or text Deals to 95495. We'll have a sweet lift ticket deal for the texters at the beginning of the season! It snowed again last night! The mountain looks beautiful right now. The bottom half is blanketed with gold and orange leaves while the top half is frosty white. Here are a couple pictures from about 8:30 this morning. We've been experiencing all four seasons today. Currently it's snowing but I can hear thunder as well. The third picture was just taken. If you cannot see the pictures right now I apologize. Blogger is having issues today and there isn't anything I can do about it. Throwing my mouse across the room didn't seem to help. You can easily tell which employees stayed up last night to watch the Rockies game and celebrate. We're the ones with the circles under our eyes. It was well worth it though! This is the first year ever that you can ski and watch the Rockies in the postseason. How great is that? There are 2 Colorado resorts now open- A Basin and Loveland. We won't be too far behind if the temperatures cool off a little more and the storms start rolling in consistently (which it is forecast to do). Start those snow dances! This Saturday we'll be at Gene Taylor's from 10am-3pm taking pass photos and selling Plus Cards. Make sure to stop by and pick up your Rockies gear along with your season pass. 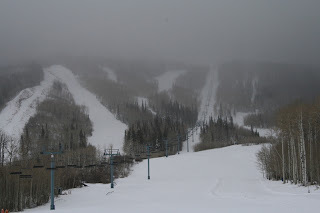 We thought it was a rumor but A Basin's website confirms it....they are opening tomorrow! 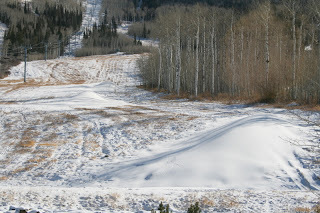 They will be the first mountain open in all of North America. So if you've got ski fever really bad, you could ditch work and ski tomorrow. 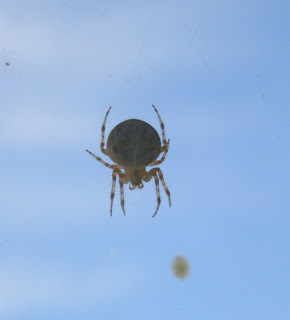 For those of you that are regular blog readers, you've met Biff, the giant man-eating spider that's been living just outside our Sales Manager's office. Well there have been developments. 1) Biff felt that it needed to relocate and build a home just outside my windows 2) Turns out Biff is an inappropriate name. It is in fact a female that has laid eggs. This is making my workday far more complicated then it needs to be. Each time I see Biff move I have an uncontrollable urge to run. This has created a highly unproductive work day for me. Why this thing has to chosen to live near the ONLY person on staff that is terrified of spiders is just beyond me. The idea that, at some point, a nest of a bajillion spiders is going to hatch 6 feet away from me is almost enough to make me pass out. On a totally unrelated topic- Go Rockies! Game 2 is at 1:00 today. We've found one TV on the mountain that has the game. Most of us will be working only on commercial breaks (just kidding Steve). The new snowcat has arrived. The second this thing pulled into the parking lot the guys lit up the radios with excitement. It's their big shiny new red toy. 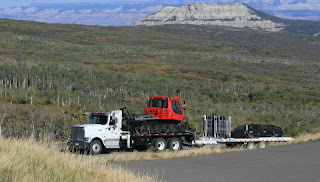 Powderhorn owns 3 snowcats and has at least 2 in operation each night. This new cat will help get more terrain groomed faster and better. The cat arrives in large pieces and has to be assembled by our Fleet Maintenance crew. How did we get to October already? Let's hope time keeps going by this fast. Only 66 days until opening day! Got word on the Warren Miller show Playground. Each ticket to the show will be worth a free lift ticket to Powderhorn! Plus we'll bring some swag to giveaway at intermission. It's the same day as the ski swap so come down, save some money on gear, get your pass photo taken, and check out the Warren Miller film. Sounds like a good day to me! Looking for new equipment this year? With all the companies and products out there it can be pretty hard to figure out what to buy. Powder Magazine launched their 2008 Buyer's Guide online this year. It's a dandy little device and makes me wonder why no one has done this before. You can search or browse all the products, read reviews, and make your own comments. We are excited to announce today that we will be using wind energy to offset the power used to run the Take Four and EZ Rider lifts. We've teamed up with Renewable Choice Energy out of Boulder and contracted for the next 3 years. The ski industry has made great strides in the last few years to help reduce our environmental impact. Powderhorn decided it was time to get serious to do our part. We depend on the enviroment to run our business and to enjoy the sport so we should definitely be doing what we can to preserve it. 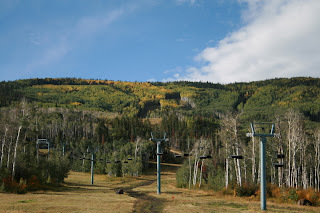 Following the lead of the Vails and Aspens of the world, Powderhorn is the first of the smaller resorts in Colorado (the Gems) to use renewable energy to offset a large portion of energy. 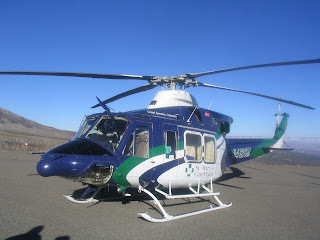 Look for more information and details soon on the website and hear more about this story in the newspaper soon. While I'm not at the mountain today, I have been informed that the top of the mountain did receive a dusting of snow last night! Sorry that there is no picture to prove it, just trust us :) As we get deeper into the fall we'll keep you updated on accumulations and how the base starts stacking up. We'll even have video coming on the website before season so you can see exactly what's going on. I stopped in Gene Taylor's today to get some skis ordered and got to see all their new tuning equipment. I have to say it's some seriously fancy stuff! 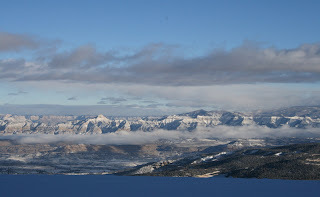 They can tune your skis or board perfectly to whatever snow conditions are the norm at the time. Plus they can now tune your bases so well that even in the middle of the season your ride can get back to the nearly perfect out-of-the-wrapper performance. The shop opens Oct. 1st. I'm sure many of you are waking up right now and looking out the window to see water everywhere. There's really no end in sight....at least until tonight. 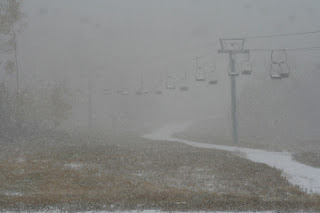 It's a steady downpour up here at the mountain so we've decided to obviously cancel the lift rides for the day. You can still come up and eat and get your season pass taken care of. The Alpine Trader has amazing sales going on right now too. The Good News- Color Sunday is such a great event that we want to make sure everyone can enjoy it at Powderhorn. So we've decided that we will run the lift next Sunday the 30th. 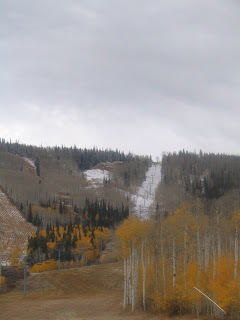 This will probably be the peak of the colors so the lift rides will be nothing short of amazing! 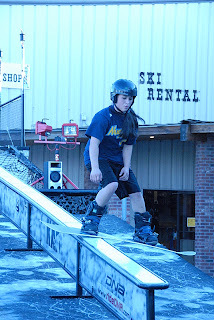 Lifts will run from 10am-3pm, $5 adults and $3 kids 12 & under. See you next Sunday! Please help spread the word. Well Color Weekend is going strong! Temperatures are perfect today and it's been nice and sunny for those riding the lift. For all you disc golfers, tomorrow is the Color Sunday Open tournament. Registration starts at 10am and the first group goes out at 11am. If you choose, there is a $10 donation for the tournament, otherwise it's free to play. Winner gets a night's stay at the Inn at Wildewood as well as two lift tickets. Course record is 48 (6 under) by Ben Thatcher. Everyone is gunning for it tomorrow! Here is the trailer for Warren Miller's new movie. I have an email into them to find out when it will be in Grand Junction. I'll let you know as soon as I know! If you travelled I-70 in the last couple days then chances are you noticed the white stuff above the Eisenhower tunnel. It has also snowed on the peaks of Breckenridge a couple times. Loveland ski area has announced it will fire up its snowmaking operations this week. I'm sure that A-Basin won't take that lying down and will hop to it as well. So the classic race to open is officially beginning! Last season A-Basin beat out Loveland putting a stop to a 7 year streak. We'll see what happens this year. 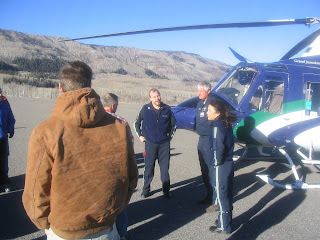 We'll keep you posted and you can always check out www.coloradoski.com to get updates. This is one of the biggest spiders I've ever seen although it's hard to tell in this picture. He has made his home outside our Sales Manager's window. Let's just say I had issues even posting this picture. Spiders are disgusting as far as I'm concerned. But the guys love it and have named him Biff. If you still need to get your season pass or plus card we'll be at Traz this Saturday from 10am to 2pm. It's also a good chance to check out all the new snowboard gear. They've told me that almost everything has come in and it's some great stuff! Go to the GJ FreePress and post your favorite picture of you tearing up the slopes at Powderhorn. This can be from any season. We'll be the judge of the coolest picture and determine a winner on November 1st. First place gets a season pass, second place gets a sweet Loki jacket. Here is the first submission...now go get after it! We're out of here! Have a safe and fun weekend. Hope you all get to go outside and enjoy the last bits of summer. The staff here at Powderhorn hit the doors running for the weekend. 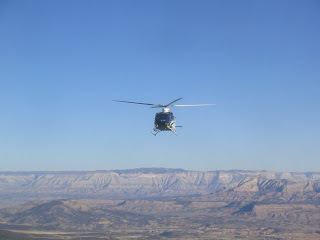 Staff plans include camping, hiking 14ers, watching football, rafting, fishing, and hunting. Enjoy! There's no snow but that's no big deal. 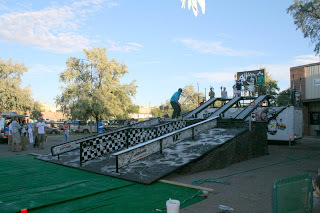 Gene Taylor's is hosting the DNA Evolution Tour rail jam tomorrow night! Practice is from 4-6 and the comp starts at 7. They're having free food and drinks and we'll be there giving away stickers, selling season passes, and hanging out. Call them at 242-8165 for details. I was in Crested Butte this weekend hiking and happened to catch this event. Here is what you have the opportunity to ride tomorrow night!